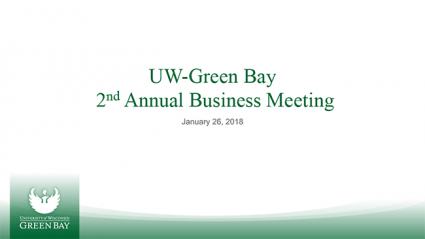 University leadership presented an update on the state of the University at the UW-Green Bay Annual Business Meeting on January 26, 2018. UW-Green Bay Chancellor Gary L. Miller, Vice Chancellor for Business and Finance Sheryl Van Gruensven, Provost and Vice Chancellor for Academic Affairs Greg Davis, and Vice Chancellor for University Advancement Tony Werner led the presentation. Guest speaker Peter Zaehringer, vice president of economic development for Greater Green Bay, spoke on the importance of higher education to the local economy and highlighted related initiatives. Two sessions were available. Each closed with an opportunity to ask questions. A video recording is available here.